It hardly seems credible today that a nineteen-year-old boy, just commissioned into the Seaforth Highlanders, could lead a platoon of men into the carnage of the Battle of the Somme. Or that, as the machine gun bullets whistled past and shells exploded, he could maintain his own morale to lead a platoon, keeping its discipline and cohesion, in spite of desperate losses. Norman Collins, the author of this superb memoir, was this remarkable man. Despite being wounded three times, Norman lived to see his hundredth birthday so becoming one of the last surviving combatants of this terrible conflict. Through his eloquent memories recorded late in life and a rare collection of letters that he wrote from the front, he tells the story of his life as a young subaltern at the front during 1916 and 1917. 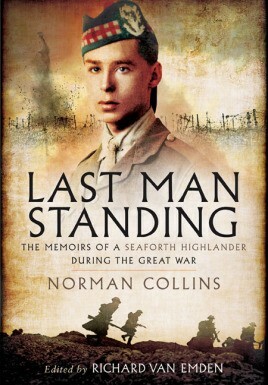 Using Norman’s own words, this book follows him from his childhood in Hartlepool to his subsequent service in France. The book also covers such shattering events as the German naval assault on Hartlepool in December 1914 when, as a seventeen-year-old, Norman was subjected to as big a bombardment as any occurring on the Western Front at that time. Norman’s enlistment and training are covered in detail in his letters, as is his posting to France and the epic attack at Beaumont Hamel in November 1916. Service at Arras in April 1917 and in the weeks prior to the Third Battle for Ypres is also recorded before serious injury hospitalized him for a year. Norman’s love for, and devotion to, the men under his command shine out in this book and his stories are gripping and deeply moving. They are illustrated by a rare collection of private photographs taken at or near the front by Norman himself, although the use of a camera was strictly proscribed by the Army. Most of the images have never been published before. Richard van Emden has interviewed over 270 veterans of the Great War and has written widely on the 1914-18 conflict.Previous books include Britain's Last Tommies, Boy Soldiers of the Great War, All Quiet on the Home Front, Prisoners of the Kaiser and the top five best-selling The Trench. He has visited the Somme and Ypres every year since 1985 and has an expert knowledge of the First World War battlefields.The Author came across Norman Collins while researching his best selling TV tie-in book Veterans. He was immediately struck by this truly remarkable character, who was then over 100 years old. Sadly Norman has now died but Richard Van Emden had not been deterred from writing what is by any standard a most exhilarating memoir of an exceptional veteran.He currently lives in London. Richard Van Emden has interviewed more than 270 veterans of the Great War and has written seventeen books on the subject including “The Trench” and “The Last Fighting Tommy”, both of which were top ten sellers. He has also worked on more than a dozen television programmes on the Great War, including the award-winning “Roses of No Man's Land”, “Britain's Boy Soldiers”, “A Poem for Harry”, “War Horse: the Real Story”, “Teenage Tommies” with Fergal Keane and most recently, “Hidden Histories: WWI's Forgotten Photographs”. He lives in London.